Looking after your dog’s oral health is an important responsibility as a pet owner. Just as a lot of bacteria builds up inside a human mouth, the same goes for your dog too. While we can brush our teeth daily to fight against this, your dog cannot do the same. Therefore, brushing your dog’s teeth on a regular basis is one of the best ways of looking after their oral hygiene. If you are going to take on the task of brushing your dog’s teeth, you obviously need the best dog toothbrush with which to do it. In this blog post, we have selected 10 of the finest pet toothbrushes on the market and given a detailed breakdown of each. This way, you can make much more of an informed decision about which one is right for you. Designed for use on smaller dogs and cats, this affordable puppy toothbrush has a small brush head which is ideal for looking after the oral health of your petite pup. If you brush your dog’s teeth on a regular basis, this has the positive knock-on effect of stopping bad breath and tartar. Both easy to hold and clean, this small dog toothbrush is also not too abrasive on your dog’s mouth. The bristles are also soft enough to reduce the likelihood of bleeding gums. Ultimately, this is a simple product which does the job well. This dual-headed dog toothbrush gives you the best of both worlds. You have both a small and a large brush head to suit pets of all sizes. This package comes as a set of six or three brushes. A set of six will last for a whole year of daily brushing. You can rest assured that the hardness of the brushes has been tested and controlled to lower the risk of harm to your pet, but still do the job effectively. If you have more than one pet, the brushes come in two colors for your convenience. A set of finger toothbrushes which are made from FDA-grade materials, the bristles are both soft and effective. Their curved profile is designed to reach the places which other dog toothbrushes struggle to get to. Make sure that you read the instructions thoroughly before you attempt to use finger toothbrushes. Generally, these brushes are easier to use on larger pets as opposed to smaller ones. This set of four dual-headed brushes and four finger brushes ensure that you have a wide range of options when it comes to brushing your dog’s teeth. Everything is color-coded in case you have several pets who all need their teeth cleaned. Ultimately, you can choose the best method of reducing the buildup of plaque and tartar in your dog’s mouth. Everything is easy-to-clean, and the bristles are designed to be gentle enough to not damage your hound’s mouth. Another dual-headed toothbrush, both sides come equipped with extra soft brushes, so you can choose which is best for your dog’s mouth. The handle is long enough for you to brush your dog’s teeth without reaching directly into their mouth. Before you attempt dog teeth cleaning, it is worth reading the directions to get a better idea what you are doing. The unique design of this small toothbrush allows you to fold the brush head back on itself. This way, bacteria are less likely to form on the bristles, and it also helps to keep the brush in good shape so you will not need to replace it so often. Its design makes it great for travel and packing away to take it wherever you need. As for the handle, it is baking soda infused and comfortable to grip. This value pack of two dual-sided brushes and a finger brush allow you to choose the best way to clean your dog’s teeth of trapped food and plaque. The brushes feature a dual-head design which works well with pooches of all sizes. This is a brush which has been built with ergonomics firmly in mind. It is ideally angled to comfortably reach your dog’s teeth, and the long handles ensure an easy reach into your dog’s mouth without having to get your hands messy. Included in this package are two dual-end toothbrushes and two pet finger toothbrushes. The brushes are dual-headed with a small and a large brush so you can easily reach into the deeper recesses of your dog’s mouth and give their teeth a good scrubbing. Made from high-quality materials, the bristles of the brush are soft enough to ensure gentle brushing and a reduced feeling of discomfort in your pet. A different design to the other dog dental care products which we have discussed so far, this one is a set of cotton gloves which work as an alternative to finger brushes. Essentially, they gives you ultimate dexterity and the opportunity to feel their teeth and get into some tough sports which you otherwise would not be able to reach. Bear in mind that you need to wash and dry these gloves after every single usage. Finally, we have this pet toothbrush which features a cylinder head. It is multi-angle to ensure that you reach all surfaces without trouble. The bristles are micro-thin to provide a thorough and gentle cleaning job. As this brush is so small and thin, it is best suited to micro breeds of dog. The design allows you to use your thumb and forefinger at the same time, removing plaque and food debris which would have been otherwise hard to access. Before buying a dog toothbrush, you should look closer at the core features which are going to help you make your mind up. After all, you want to choose a brush which is best suited to your pooch, as well as one which is comfortable for you to use. Here are just a few of the most important points which you need to bear in mind. You have several different types of dog toothbrush to choose from. First up, you have the standard toothbrushes which essentially follow the design of human toothbrushes. They either come in single or dual-headed formats. Alternatively, you have the finger toothbrushes which you pop onto the ends of your fingers to scrub your dog’s teeth. And you also have the cotton finger covers which work in a similar way. We will discuss some of the main pros and cons of each a little bit later in the blog post. The brush head size which you choose should be related to the size of your dog’s mouth and teeth. As you would expect, smaller dogs need smaller brush heads, while larger breeds require larger ones. 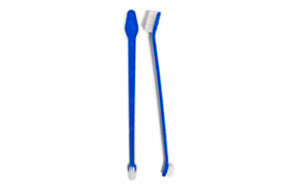 Alternatively, you could look at the dual-head toothbrushes which are suitable for smaller and larger breeds alike. If you get a standard design toothbrush, it is worth looking closer at the handle length. If you don’t like the idea of sticking your hand directly into your dog’s mouth, a brush with a longer handle is the best option. This also has the natural advantage of allowing you to get right to the back of their mouth to access the harder-to-reach areas. However, you don’t want the handle to be too long as this is going to be more challengin to wield and get into the harder-to-reach areas of their mouth. Another defining issue which you should consider when choosing a toothbrush for your furry friend is the softness of the bristles. This is one of the major differentiating factors between dog and human toothbrushes. You want the bristles to be soft enough to not damage your dog’s sensitive teeth and gums. Ideally, they should be even softer than a toothbrush which has been designed for babies. Since you are the one who will be holding the dog toothbrush, you want it to be comfortable in your grip. If you get the opportunity to pick up a few different pet toothbrushes beforehand, this will help you to compare and contrast the different handles. It should be lightweight enough for you to move around easily, and you should feel comfortable holding it in a number of different positions. Dog toothbrushes come in two main varieties: regular brushes and finger brushes. The decision of which one is best for your pooch should be based on several factors including the size of your dog, tooth health, and general temperament. So, let’s look at both varieties in more detail to give you a helping hand in making your mind up. First up, we have the regular variety of dog toothbrushes. Just like human toothbrushes, they consist of a handle for holding and bristles for brushing. Often, they have a longer handle which makes it easier to get the brush into your dog’s mouth, and they are sometimes double-sided, so you can choose the size of the bristles which are best for your dog and the task in hand. As for the brush head, it is angled more acutely due to the different shapes of canine teeth. The neck also tends to be angled, allowing you to get right to the back of their teeth. Dogs with larger mouths often benefit from this type of brush. You don’t have as much control as with the finger brushes, but you also don’t have to worry about putting your hands in your pooch’s mouth. The other main variety of dog toothbrush is the finger brushes. These simply slide over your fingers and allow you to clean your dog’s teeth with the soft, flexible bristles. As well as removing debris, the bristles make it easier to massage their gums as well. This variety can be especially effective when you have a puppy who is not used to having their teeth cleaned. While these brushes give you more control, they don’t give you the same reach as regular brushes. You may also not feel comfortable reaching into your dog’s mouth in this way. Some of the product options above include both regular and finger brushes, so rather than having to choose between two, you have both. This way, you can clean your dog’s teeth in any way that you think is best. Also, this is a good option if you have multiple dogs. All dog owners who want to take good care of their dog’s dental hygiene should use a canine toothbrush. Of course, this is not the type of activity which many dogs enjoy, but it is one which is essential in looking after your pup’s teeth and gums. Ideally, you should start brushing their teeth from a young age, so they become used to the process. Ultimately, this is a process which will take patience and a gentle hand. Ideally, you should get into the habit of brushing your dog’s teeth every day. Just like human toothbrushes, you need to replace them on a regular basis when the bristles become frayed. Otherwise, they won’t do the job as effectively. Of course, a puppy toothbrush isn’t going to take care of everything in your canine’s oral hygiene. You also need to specially designed dog toothpaste. Watching what they eat is also important, and you should also give them things to chew on. This natural action can help to break up plaque and tartar. And you also need to take your pooch to a veterinary dentist. Oral and dental health issues need to be diagnosed and treated at the earliest possible opportunity. Tartar which has already cemented itself on your dog’s teeth cannot be removed by regular toothbrushing. As well as looking after your dog’s teeth, there are other advantages involved in brushing on a regular basis. First of all, your pooch will have fresher breath, which is bound to be a relief the next time they dive in for a big, wet, slobbery kiss! Also, putting anything in your dog’s mouth requires trust. Once they get used to it, this is yet another way of developing a stronger owner-pet bond. Even if it may not be the most enjoyable experience for the two of you, it is still one which can bring you closer together. If you have never brushed your dog’s teeth before, there is no doubt that this can feel like a daunting and slightly intimidating activity. You need to have the correct equipment, the setting needs to be right, and you should ensure you follow appropriate techniques. To make this entire process easier, we are going to give you a few top tips which you can follow. Before you get started on the task of brushing your dog’s teeth, you need to have all the right equipment ready to go. First, select your dog toothbrush. If you want to have all your bases covered, you should get a regular toothbrush and finger toothbrushes too. Choose a dog-friendly toothpaste rather than one which has been designed for humans, as this is not meant to be swallowed and can end up causing stomach upsets. Bear in mind that the equipment needs to be comfortable for you to use, as well as pleasant for your dog. It is easiest to brush your pup’s teeth when you have been training them to get used to the experience from a young age. However, if you have not done this, you are likely to find that the whole process is more of a challenge. Ideally, they should be calm and relaxed before teeth brushing begins. The easiest way of doing this is by tiring them out beforehand, so why not take them out on a vigorous exercise session of 30 minutes or more. When your pet is tired, they are much less likely to resist your efforts to brush their teeth. Having their favorite toy nearby is another way to keep them calm. Your first few attempts to brush their teeth are likely to be more of a challenge, but it is all about persistence. Keep these first few sessions short and sweet. Over time, your dog should become more used to having their teeth brushed and you can be more thorough. During the whole process of brushing your dog’s teeth, both of you need to be in a comfortable position to help everything go smoothly. You should be at the same height as your dog. If you stand above them, this can be interpreted as a threatening position. If you are below them, your pooch may try to take this as an opportunity to play. Your dog is likely to move around during the process, and you need to move with them. Before your first brushing session, it is worth doing some prep work to get your dog ready. After all, you don’t know quite how your pup is going to react when you start touching their mouth. So, you can start by getting into the habit of touching their mouth on a regular basis. Offer your dog plenty of praise and encouragement, and also have a few treats to offer them. But make sure that your hands are well out of the way while they are chomping on these! You can also use this as an opportunity to get them used to the taste of the toothpaste. Don’t rush into sticking the toothbrush straight into your dog’s mouth. Instead, hold it in your hand and let your dog come to it on their own. You can then add some toothpaste and give them the chance to lick it off. Start by brushing a few of their front teeth but go slowly. Just because they are more comfortable with the toothbrush, it doesn’t mean that the whole process is going to be straightforward. You need to take your time and have plenty of patience if you are going to make a success of this activity. For many dogs, brushing their teeth is never going to be a process which they particularly enjoy, so you need to be very gentle and careful with them. Slowly lift up their lip to expose their teeth and gums. When you actually start the brushing process, you should use careful motions, being especially cautious not to poke your dog. You want to cause them as little discomfort as possible. Think about how you brush your own teeth and use this as a guideline of what to do. During the process, you should speak to your dog throughout to reassure them that everything is okay. The sound of your voice alone can help to offer them a lot of reassurance. The outsides of your dog’s teeth are the easiest ones to reach, so it makes sense that you start by brushing these ones. You can then move onto the upper surfaces and canines, which tend to quickly build up tartar. Many pets will not allow you to reach the inside surfaces of their teeth. If they don’t, there is no point in trying to force the issue. Even if you clean your dog’s teeth thoroughly, you should still take them in to a professional at least once per year. As well as checking your dog’s oral health, they will be able to reach the spots in your dog’s mouth which you are struggling with. The last thing that you want is to put your dog through extreme discomfort, so you should take your cues from the way that they are reacting and the noises that they are making. You should also watch out for negative signs like bleeding gums which are an indication that you are brushing in the wrong way. You also need to be careful of your own safety. Some dogs have a tendency to bite on toothbrushes, whether they can help it or not. Always give your dog a reward afterward as this is not a particularly pleasant experience for them to go through. Also, it helps you to positively reinforce that something nice is going to happen at the end of the brushing process. Give them some extra attention or let them enjoy their favorite activity. And having some food treats ready are always going to be popular with your pooch too! A: You should never use a toothbrush which has been designed for a human on your dog. Dog toothbrushes have been specifically made for canines, whereas human models have both larger brush heads and stiffer bristles. Dogs have sensitive gums and these brushes could end up causing damage. Also, they are angled in a different way, so you are unlikely to be able to reach right to the back of their mouth. Baby toothbrushes are closer to the variety which is needed for dogs, but these often tend to have a shorter handle. Ultimately, your best option is to use a special dog toothbrush which has been made for the task in hand. Q: How often should I replace my dog's toothbrush? A: Just like the question of how often to replace your own toothbrush, there are no hard and fast rules with your dog’s brush. Many people say between four to six months, but others think every two months is best. Several things can influence the frequency. Obviously, the quality of the brush makes a difference, which is why it is worth investing in a high-quality model in the first place. This way, you won’t have to keep replacing it more often than necessary. And the frequency of the brushing also matters. If you don’t brush your dog’s teeth as often, the brush will not need to be switched so frequently. Another important issue is how your dog behaves when you are brushing their teeth. If your dog is rough with the brush and chews it up, it is obviously not going to last for as long. You can tell when it is time to replace your own toothbrush, and the same goes for your dog’s. Simply check the head of the brush to determine the condition of the bristles. If they look frayed and they are pointing in all different directions, it is time for a replacement. A: Keeping your dog’s toothbrush clean is important in ensuring that it doesn’t become full of bacteria and it continues to do the job effectively. Think about how you would clean your own toothbrush. Start off by rinsing it in warm water and clearing away any obvious debris. Make sure that you have a proper storage space for the brush where it is not going to get cross-contaminated. You could even get a toothbrush cover for some added protection. From time to time, you could also look into sanitizing your dog’s toothbrush. Use a solution of distilled white vinegar and water. You should soak the brush in the solution for 30 minutes before rinsing it off with warm water. Every four to size weeks is a good rule of thumb for disinfecting, but you could do it more often if you believe it necessary. Our favorite dog toothbrush is this one from CET. A simple and affordable option, it is best-suited to small dogs. The brush head is small, but the handle should be long enough to get to those hard-to-reach areas in your dog’s mouth. The bristles are not too hard and shouldn’t be painful on your dog’s gums and other sensitive areas of their mouth. Ultimately, it does everything that you need to properly look after the oral health of your dog, which is why we have put it at the top of our list of best toothbrushes for small dogs.